Financial crisis which were occured especially after 1980, damaged particularly Turkish Banking System then all financial system and caused to be determine by researchers seriously. 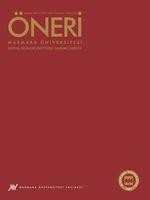 In this line, the aim of this study is searching the effect of the profitability performance of commercial banks in Turkish Banking System comparing with the financial crisis which were occured in 1999, 2000, 2001 and 2008. With this purpose, three profitability ratios were published in the Banks Association of Turkey were taken as dependent variables and four financial ratio groups were taken as independent variables and it was set up a regression model for every related year. As a result of this study, the ratio group of income and expense took over for dependent variables which are the profitability of asset and the profitability of equity at analyzed years. The margin of interest didn’t stand out at 1999, 2000 and 2008 but at 2001, the ratio group of income and expense and the ratio group of adequacy of capital took over for dependent variable which is the margin of net interest. ISNAD TELLİ, Açelya . "1999, 2000, 2001 ve 2008 KRİZ DÖNEMLERİNDE TÜRK TİCARİ BANKALARININ KÂRLILIKLARININ LOJİSTİK REGRESYON ANALİZİ İLE İNCELENMESİ". Öneri Dergisi 12 / 45 (February 2016): 61-91.